Bhubaneswar, February 22: India successfully tests fired nuclear-capable ballistic missile Prithvi-II from Odisha coast – in a first night trial on Wednesday. The missile was test fired from a mobile launcher positioned at the launching complex III (LC-III) of the Integrated Test Range (ITR). Mounted on a Mobile Tatra transporter-erector Launcher (MTL) and equipped with state of the art guidance system, the indigenously developed missile was fired in a real-time situation. Prithvi-II is India’s first developed and inducted indigenous surface-to-surface strategic missile. It is capable of, capable of attacking targets at a range of 350 km. 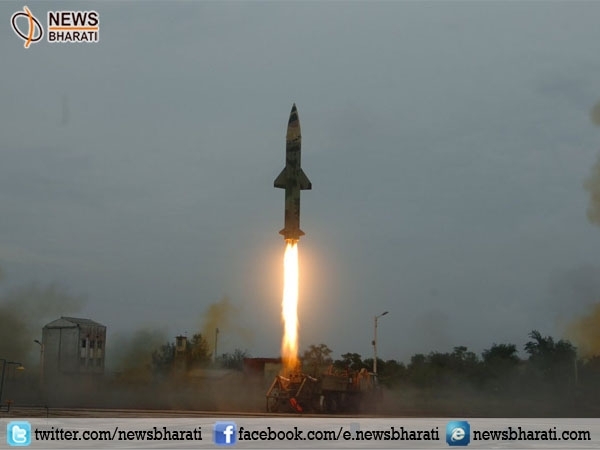 The test came two days after the successful trial of 2,000 km range Intermediate Range Ballistic Missile (IRBM) Agni-II from Abdul Kalam Island. The 8.56-meter long missile with a diameter of one metre has the capability to carry one tonne of the warhead. It can target mobile targets including unmanned aerial vehicles. It was in 2003 when the single stage liquid propelled weapon developed by DRDO was inducted into the Armed Forces. It is into series of production since then. “The night trial is highly significant as all preparations are done in dark so that it can be invisible to enemies. This was first trial of Prithvi-II during night and it has met all mission parameters as coordinated,” a defence official was quoted as saying in a report. The missile reached the predefined target in the Bay of Bengal while being guided by an accurate Inertial Navigation System (INS) and controlled by the thrust vector control and Aero-dynamic control systems.